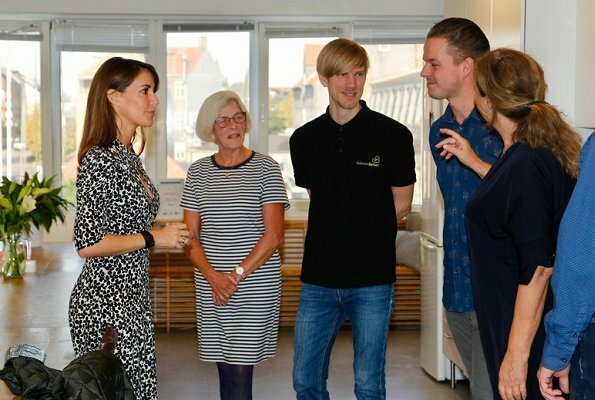 Today, Danish Princess Marie visited The Danish Food Bank (FødevareBanken) in Copenhagen. The Danish Food Bank is a nonprofit organisation which struggles with food waste and food poverty in Denmark. The Danish Food Bank was established as a voluntary association in January 2008. The Danish Food Bank struggles with food waste and provides better food to socially disadvantaged people in Denmark. I agree. This dress fits Marie nicely and is a good length. Very busy looking dress. But Pss Marie looks great wearing it. Me pasa lo mismo que a Uds. It is always a pleasure to look at photos of Marie! I find Marie's style smart and simple and she usually chooses clothes she also can wear at her office work as a projet developer at the Danish Emergency Management Agency. She does not receive any apanage even though she has official duties just like CP Mary. I didn't know that she doesn't get apanage, she must feel unequal regarding this with Mary. A nice, simple and youthful look. The perfect work outfit. Nice dress, shoes not so and her hair needs a new, modern style.